Was your home hit with storm damage? Does your roof need to be repaired or replaced and are you looking for a quality top rated roofing contractor? We have been in business for over 30 years and we can help you with all of your home improvement and home repair needs. We have services to cover a brand new roof, siding, gutters, or windows ? 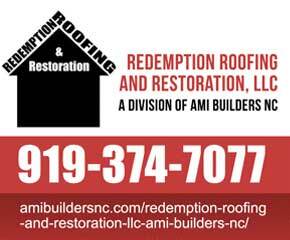 AMI BUILDERS NC – offers Free Roof Quotes and Roof Estimates in the triangle areas to include: Raleigh, Cary, Durham, Chapel Hill, Holly Springs, Garner, Knightdale and Apex NC. We also offer residential homes with Home solutions to address siding, gutters or windows, we use nothing but industry quality materials and products coupled with excellent workmanship that you can rely on. We will help you identify your trouble areas and damages and work with both you and your insurance company file your claim. We will insure that everything is reported to make sure you receive all the repairs your insurance covers. So whether your home was hit and damaged by a storm, and suffered wind, or hail damage we are we equipped to make all necessary repairs and installations. Roofing NC Free Quote Estimate Inspection Raleigh NC. We will make sure all the repairs are made on time as promised and work hard to keep your respect and trust. It is simple just fill out the short Contact us form for your free no obligation inspection and or Roof Quote. Free Roof Inspections, Free Roof Quotes, Free Roof Estimates, Free Roof Design, Free Roof Repair and Energy Analysis for the Raleigh Durham Chapel Hill Area. Roofing NC Free Quote Estimate Inspection, Raleigh Free Roof Quote, Roof Inspection done right, Free Inspection, Storm Damage Roof Repair Raleigh NC.